Buckinghamshire based Saddle Safari originally opened in1993 as a small cycle hire business with the focus on offering tourists and locals a simple and fun way of seeing this beautiful part of the world. The business is now celebrating 25 years in business, having gradually evolved into a traditional bike shop. Since moving to a new location in 2012 Saddle Safari now boasts a purpose built cycle shop on Dean Street in Marlow - around the corner from the old premises but with three times the space. The new shop benefits from a large professional workshop which is run by four Cytech qualified mechanics, a fantastic range of clothing and changing rooms and a bike fit area, alongside a wider range of bikes and accessories. The shop are also proud to be Ice Trike dealers, a fantastic product built in Falmouth Cornwall which are becoming increasingly popular both with the able bodied and the disabled. Earlier this year Saddle Safari marked their 25 year anniversary with a series of charitable events, starting by collecting used bikes to send to Africa to be used by people who need transport and are unable to get around. The shop also hosted a pop-up cinema with beer and ice cream, and a family fun day, with all proceeds going to the charity SportsAble, which provides sporting facilities for disabled people. Celebrating 50 years in business this year, Mitchell Cycles are the longest running family bike shop in the Swindon area. Since 1968 Mitchell Cycles have been sharing knowledge on all things bike - from the smallest nut to the most expensive bikes. The shop boasts over 250 bikes on display; from Children's to Elite level bikes, with an additional 2000 bikes from 11 of the top brands and manufacturers including Kona, Merida, Raleigh and Dawes, available to order. Mitchell Cycles are proud to have Cytech qualified mechanics in their workshop, and are a recognised Shimano Service Centre. As well as bike sales, Mitchell Cycles are passionate about racing. Team Mitchell Cycles, managed by head mechanic Dave, is a distinguished Mountain Bike racing team - racing both nationally and in Europe. Don Valley Cycles opened its doors on June 7th 1993 and celebrates 25 years in business this year! Founded by former Great Britain cyclist, Martin Maltby, the shop fast became a hub for local cyclists, and main sponsor for the Doncaster Wheelers Cycling Club. Today, the shop employs a team of dedicated, passionate staff, and provides advice, guidance and support to riders of all levels and abilities in Doncaster and surrounding areas. Don Valley Cycles has sponsored their local cycling club for nearly 20 years now of which Martin Maltby is a key member of, he also runs beginners riders on Saturday mornings and invites new customers with their bikes to come along and get advice on the road about their new purchase. Martin has also been instrumental in setting up a go-ride junior coaching section for Doncaster Wheelers c.c. and is one of the lead coaches, this has grown to over 50 children taking part in coaching sessions each week. The shop stocks top quality brands and accessories as well as new to market niche brands. All staff are lifelong cyclists with excellent product knowledge, helping customers to make the right decision when looking for their new bike. Don Valley Cycles boasts a fully equipped workshop and bike servicing facilities, where customers are offered a variety of servicing options and bespoke repairs, including wheel truing and spoke replacement. All repairs are carried out by Cytech accredited technicians on-site. 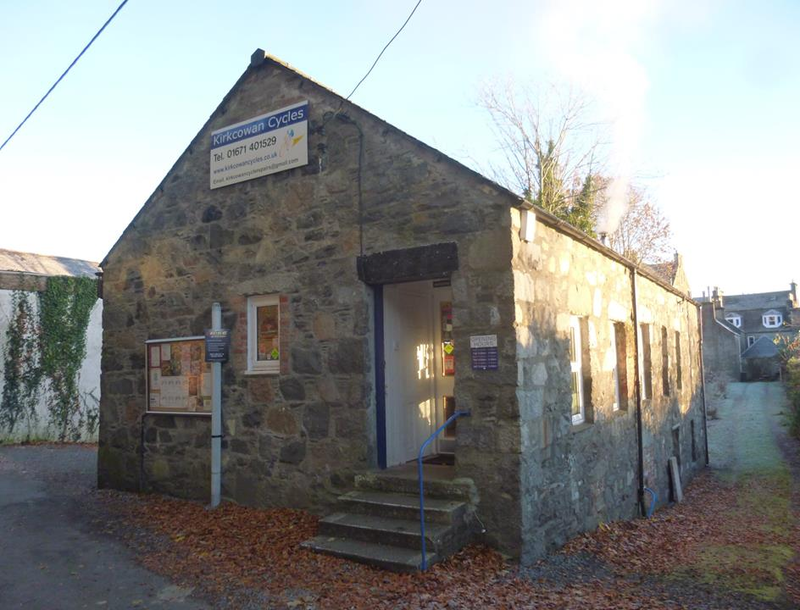 Kirkcowan Cycles started off as purely a service and repair centre run from home but has since evolved into a one stop cycling shop offering year round service to the local community. At the end of 2014 Kirkcowan Cycles moved into a new shop in Newton Stewart, Dumfries & Galloway, selling bikes from some of the biggest brands including Raleigh, Merida, Forme, Bobbin and FreeGo electric bikes. Kirkcowan Cycles participate in a range of cycle schemes as well as offering Ride it away retail finance, to help every customer get the bike they really want. If your bike needs servicing or repairs, Kirkcowan Cycles have 20 years of experience repairing all kinds of bikes from Sturmey 3 speed to a modern 22 speed carbon fibre road bike. Their fully stocked workshop is ready to get you back on the road in no time! Kirkcowan Cycles are proud to have been shortlisted by the Independent Retailers Confederation as one of 20 of the Best Small Shops in the UK in 2015, after only being in their new shop for just a few months. The competition celebrates the entrepreneurial spirit and community ethos of small shops in the UK and the final 20 shops were shortlisted from over 300 entries! Established in 2006 Cyclehouse is a family owned and run company that can trace its roots way back to the 1920's when the late Henry Owen sold refurbished bicycles and gramophones from his shed in Wirral! 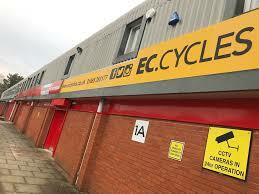 Today, business is conducted from their large cycle store based in Warrington, in the North West of England. Cyclehouse's large open plan showroom contains a wide range of Bikes on display and stock many of the best brands in cycling including Cannondale, Scott, Whyte, GT, Ridgeback and Marin. Whether you're a commuter, leisure rider or a competitive cyclist, Cyclehouse have a comprehensive range of bikes and a wealth of experience. In 2017 electric bikes were added to their range and they now stock Scott models with their amazing high power Bosch, Shimano, Brose and Yamaha motors through to Wisper's fantastic leisure range offering great looking and great value e bikes. Along with the bikes there's a range of cycle clothing from Endura and Altura, plus a full line of accessories from Syncros, Shimano, Mavic, Continental, Time, Lezyne, S.I.S, Giro, Topeak, Hamax and many more. Cyclehouse's workshop is fully kitted out with Park Tools and the mechanics are all Cytech trained. Whether it's customizing a bike to suit your needs, considering part exchange, offering flexible 0% finance packages or anything else bike related, Cyclehouse pride themselves on being here to help. EC Cycles in Merthyr Tydfil pride themselves on providing a friendly, professional but individual service. Whether you are an experienced cyclist or a complete beginner, they are here to help. With over 35 years experience in the cycle industry EC Cycles are proud to present a shop that combines road, electric, mountain, kid's, urban and commuter bikes and accessories all under one roof. EC Cycles stock bikes from some of the biggest brands including Giant, Scott and Whyte, available to purchase via Cycle to Work schemes or Ride it away retail finance. The shop's split level layout offers free car parking with easy access and is situated just five minutes from Bike Park Wales. EC Cycles have established a reputation for providing high quality products, competitive prices, value for money, first class customer service and reliable technical repairs. The fully equipped workshop is run by qualified Cytech mechanics. Founded in the early 1980's, Scotby Cycles started out selling reconditioned bikes from a small premises in the village of Scotby. Since then the shop has grown massively, moving to its current location in a large repurposed theatre/cinema/dancehall/bingo pallor in the early 2000's. 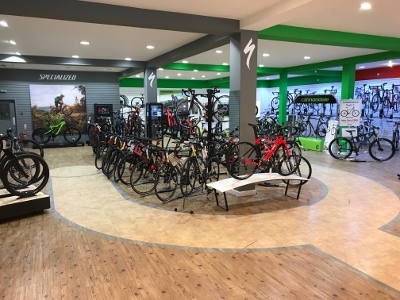 Scotby Cycles, owned by Gary Dickson, is now one of the largest independent retailers in the UK with a 5000 sq ft showroom, plus three addition floors for storage. Whilst the showroom is ideal for local customers, it's the online shop which has proven key to driving the business forward, with 65% of purchases now made via the e-commerce store. They stock some of the biggest and most innovative cycling brands both online and in store, including Specialized and Cannondale plus clothing and accessories from ORTLIEB, KASK, Five Ten, Fox Racing, Brooks saddles and Castelli to name but a few. Situated on the edge of the Lake District, on both Hadrians Cycleway and the Land's End to John o'Groats (LEJOG) cycle routes makes them an ideal pit stop for those cyclists with bikes in need of a cycle mechanics TLC and a cup of tea! Throughout the years, the company has grown leaps and bounds but they remain focused on their core values of providing a level of customer service which they themselves would expect to receive and to offer customers the best possible deals. Their fully equipped workshop is open six days a week with experienced Cytech qualified bicycle mechanics on hand at all times. Scotby Cycles pride themselves on being able to handle bikes of any kind from full suspension mountain bikes, road bikes with electronic shifting systems and even eBikes. Dialled In Bikes is a traditional "Local Bike Shop", offering sales of new bikes, servicing and repairs plus sales of parts, spares, and accessories. 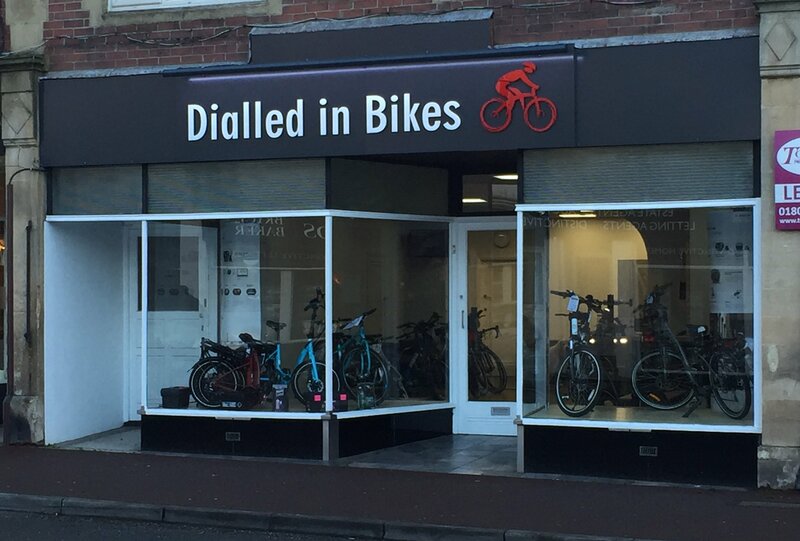 Since opening in 2010 in Paignton, Devon, Dialled In Bikes has gained a great reputation for the quality and range of expertise offered and in December 2017 moved to an impressive new facility featuring a larger bike showroom and new hi-tech workshop. Servicing and repairs forms the heart of the business and their workshop, recently described by one customer as looking like an operating theatre, is equipped with an extensive range of specialist tools and equipment enabling them to carry out almost any repair or service your bike requires from everyday adjustments to suspension servicing, custom wheel building, component upgrades and even restoration projects to retro and older bikes. As e-bike specialists and as an accredited Bosch Service Centre, Dialled in Bikes will look after any e-bike and have also gained a great reputation for their knowledge in this fast-emerging area. All staff are Cytech and Bosch qualified mechanics and have many years of experience looking after bikes. Owner Simon Pedrick is also a qualified mechanical and production engineer. Bringing that engineering experience, knowledge and understanding to cycle servicing and repair is Dialled In Bikes "added extra" providing a superior level of service. As well as Cycle To Work schemes, Dialled In Bikes offers customers the chance to spread the cost of their new bike by using Ride it away retail finance. 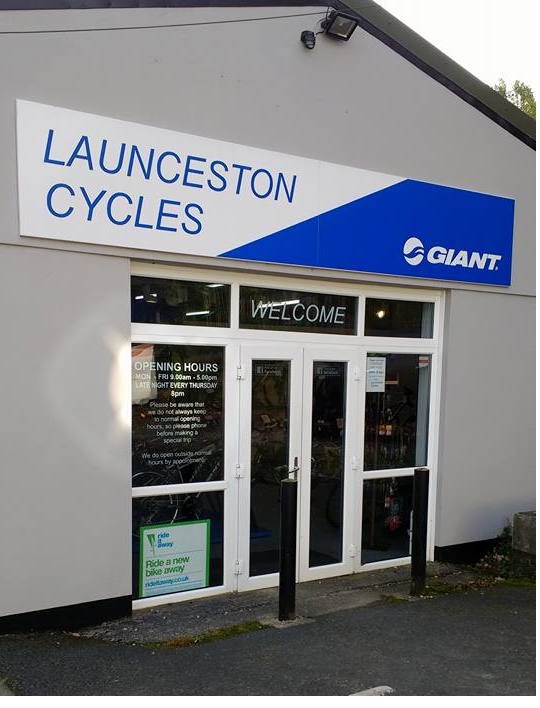 Launceston Cycles is a family run business in Launceston, Cornwall. Whether you ride as a family, for fitness, commuting, competition, touring or just for fun and feel the freedom cycling offers, Launceston Cycles can help. They are a dedicated cycle shop with experienced, qualified staff who have a passion for cycling. As a GIANT partner store, you'll find a range of Road, Cross, Mountain, Hybrid and e-bikes as well as accessories from Shimano, Endura, Brooks, Cat Eye, Topeak, Exposure, Giant, Bell and Giro to name just a few! To help you buy your perfect bike and accessories they also offer interest free finance via Ride it away and cycle to work schemes. As well as selling bikes, Launceston Cycles are a Shimano Service Centre carrying out repairs and servicing to a high standard by a Cytech qualified technician. From brake adjustment, gear set up, to full services, wheel building, wheel truing, spoke replacement - no job is too big or too small!